﻿ House Plan Drawing Software | Build Your Future Dream Home! Finding your dream house or renovating the existing one is always a challenge so why not build one yourself? That way you’ll be absolutely sure your new dwelling satisfies all your needs and provides maximum comfort. When it comes to planning, don’t be in a rush to hire a professional architect or home designer, you can do everything yourself with a convenient program to draw house plans. 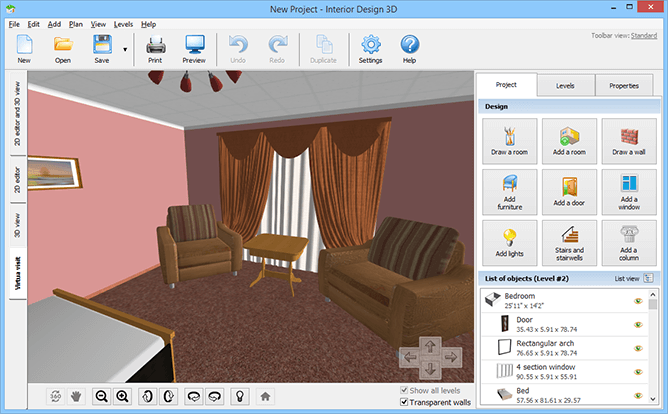 Interior Design 3D is a perfect tool for amateur designers. Keep reading and you'll learn how to use it for your own benefit. WANT TO DESIGN YOUR DREAM HOUSE? Why Should You Try Interior Design 3D? Interior Design 3D is the best house plan software that gives your full control over your digital living space and lets you render even the smallest decor elements. The program comes with a wide array of CAD tools, but is extremely easy to use. What’s more, think of all the money you’re going to save on the architect’s services - getting the software now, you can freely use it for many years to come. In the start-up wizard you can take a look at sample floor plans built into the program collection. These templates represent furnished multi-storey houses so you can click around to better understand how the program works. It’s also a good idea to use one of these samples as a base for your own project. Select some wall and drag it sidewards to make the chosen room bigger or smaller. Replace home decor elements or add more windows - all these samples are fully customizable. With Interior Design 3D making a floor plan from scratch is a straightforward process. This house plan design software lets you draw a room of any size and shape, and add interior walls to divide your living space. The program will automatically calculate real dimensions, including the total floor area, the wall height and width. If you have some sketches of what your future house should look like, add the scanned plan from your computer to the program. Outline it using the wall-drawing tool and move forward with its further designing. To make a multi-storey house plan, simply click Add Level and continue building the rooms above. This computer program to draw house plans puts all the tools you may need right at your fingertips. In the settings menu you can easily change the units of measurement in accordance to your country at any stage of plan creation. Add different types of doors and windows to your rooms. There’re standard, arched, double and balcony designs whose properties can be changed to fit into your interior. One of the program standout features is the Staircase Constructor. Once you decide to place stairs, this tool automatically makes an opening in the ceiling, and lets you customize steps, handrails and landing. There’re over 600 materials and furniture items available in this house plan drawing software. 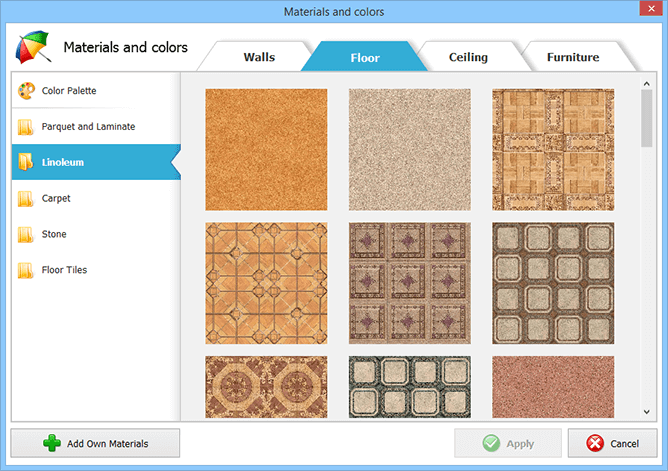 Double-click at any wall and the program will open the Materials and Colors window. Here you can choose various types of wallpapers, wall tiles, parquet and laminate, carpet, linoleum and ceiling panels. Experiment with different colors and textures to achieve the best match. Furnish your whole house using the collection of special items for a living room, kitchen, bedroom, office, hallway, bathroom, and other premises. All furniture items in this virtual room planner are ready to be dropped on your house map, aligned and arranged to the state of perfection. 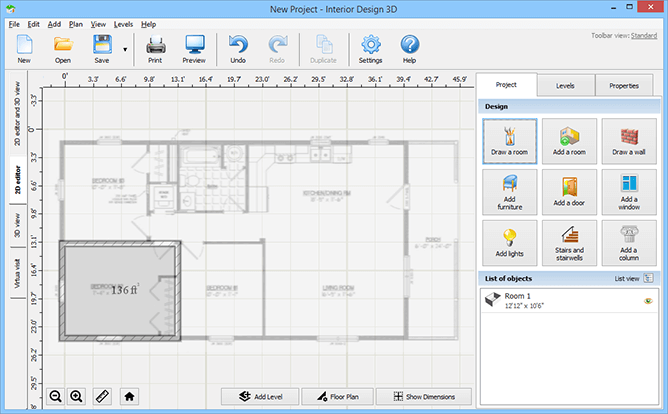 All the floor plans you create in the 2D editor are simultaneously showcased in the 3D view. This split screen lets you try different decor materials and position furniture where you want within the design. At the same time, you can see the real-like placement of all objects in the 3D model rather than from above. A cherry on top of all the program functions is the Virtual Visit option. Take a tour of your visualized house plan in 3D. Move from one room to another, check if the wall color goes well with the chosen laminate, make sure there’s enough space and the whole house isn’t too crammed. For more design experiments, save your project on the computer and get back to improving it anytime you want. If you’re completely satisfied with the result, save it as JPEG or PDF. You can choose what view of your house to save - floor plan, 3D interior or both of them. 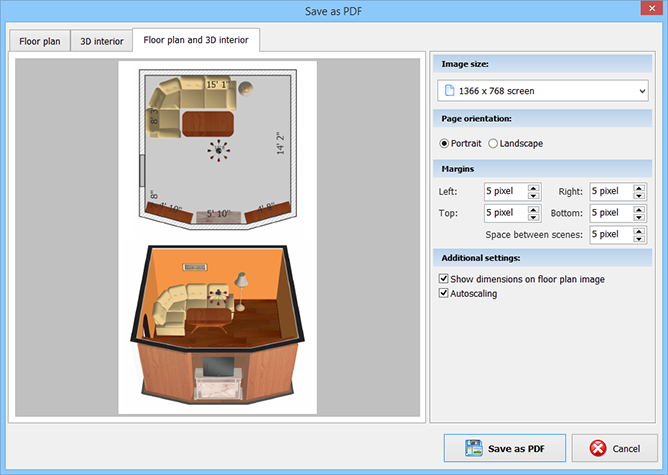 The smart save module helps you position all the elements on the page and prepare the file for printing. One more option is to save your project for external 3D editors. 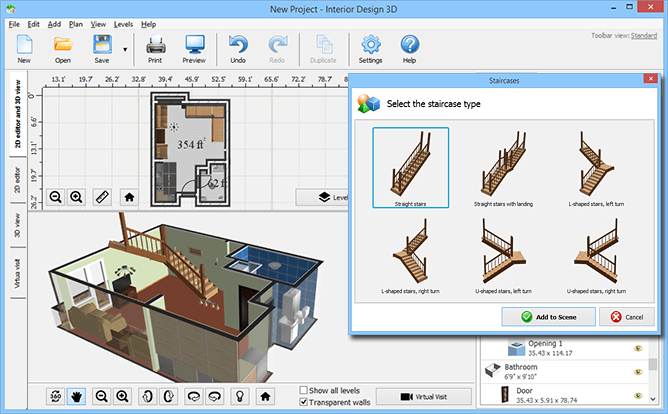 Interior Design 3D boasts an easy-to-use interface, intelligent building tools and hundreds of decor elements that will help you design your digital home in an hour or even less. Try the program for free! 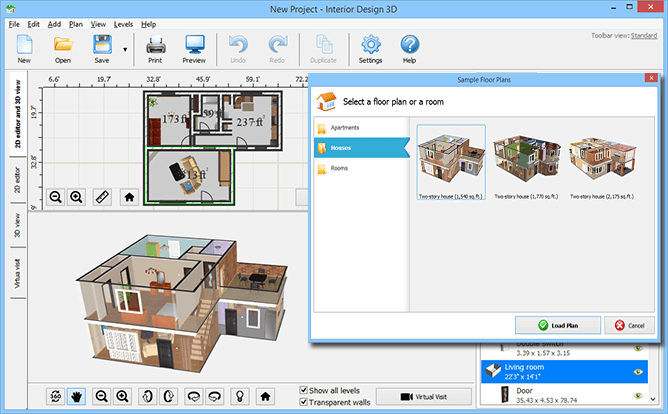 Download this house plan software and start using it for large-volume projects and small DIY home improvements. Floor Plan Drawing Software: What to Look For?